Hasbro revealed a few goodies at SDCC already, but there are more items yet to show. Actually, this might be it for the year - I don't know, given how quickly the Han Solo movie will (allegedly) be released. The gamut of Force Friday II products were shown, but you've seen and hopefully already bought those. Here, you'll find new 2-packs, single figures, and newish creatures. No new vehicles were displayed at this event. Not one, but four new 3 3/4-inch figures were revealed by Hasbro to us today! 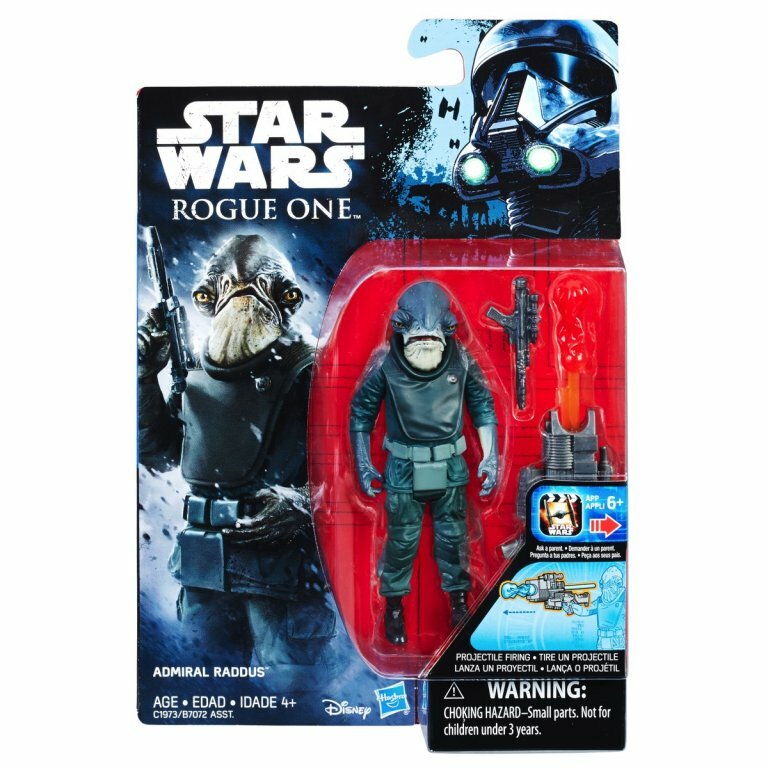 Admiral Raddus, Lt. Sefla, Fenn Rau, and Galen Erso are all now revealed in their packaging. You might have seen some of these before elsewhere, but if you haven't? It's new to you! Pictures after the break. Enter the world of STAR WARS and launch into action and adventure! Each 3.75-inch figure features five points of articulation and comes with their iconic battle accessories. Characters include heroes and villains from ROGUE ONE: A STAR WARS STORY such as JYN ERSO, K-2SO, IMPERIAL GROUND CREW, GALEN ERSO, and IMPERIAL STORMTROOPER, STAR WARS REBELS characters including KANAN JARRUS (Stormtrooper Disguise) and SABINE WREN, and KYLO REN and REY (JAKKU) from STAR WARS: THE FORCE AWAKENS. Each figure sold separately. Available at most major retailers and on HasbroToyShop.com. Compatible with the HASBRO STAR WARS STUDIOFX App. There is another two-pack! Hasbro sent along this block of copy and two shots of what looks to be the action figure set of the season. Pick a side in the galactic battle between good and evil! Choose between the IMPERIAL DEATH TROOPER and REBEL COMMANDO PAO or the SCARIF STORMTROOPER and MOROFF from ROGUE ONE: A STAR WARS STORY, or relive the events from STAR WARS: THE FORCE AWAKENS with POE DAMERON and the FIRST ORDER SNOWTROOPER. Each 3.75-INCH DELUXE FIGURE 2-PACK comes with 2 figures and multiple accessories, including a dual-projectile launcher. Each pack sold separately. Available at most major retailers and on HasbroToyShop.com. Compatible with the HASBRO STAR WARS STUDIOFX App. Bring ROGUE ONE: A STAR WARS STORY to life with this 12-inch electronic figure! Jump into action with the elite IMPERIAL DEATH TROOPER, by squeezing the figure’s legs to activate authentic battle sounds. Each figure sold separately. Requires one 1.5V AA battery. Available at most major retailers and on HasbroToyShop.com. Compatible with the HASBRO STAR WARS STUDIOFX App. Special thanks to Hasbro and their PR team for sending us this first look at Galen Erso, a character from Rogue One: A Star Wars Story. (If you haven't seen it yet and consider this a spoiler, a month out, that's on you.) He includes a blaster and a Mouse Droid, which is a pretty nifty extra for those of us looking to populate that Death Star playset. The one we hope to get some day. Hopefully. Well, take a look - we've got a packaged shot and an unpackaged shot after the break. 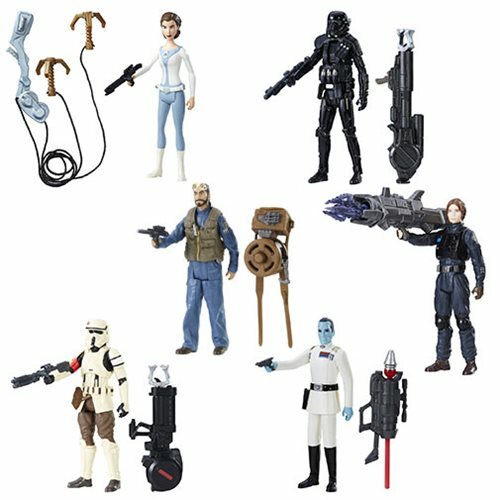 Ad: You probably haven't seen them in the wild, so get Bodhi Rook, Grand Admiral Thrawn, the Scarif Stormtrooper, a Death Trooper, Jyn Erso in Disguise, and Princess Leia in Star Wars Rogue One 3 3/4-Inch Action Figures Wave 3 Set at Entertainment Earth! They're in stock now and the set qualifies for free shipping. 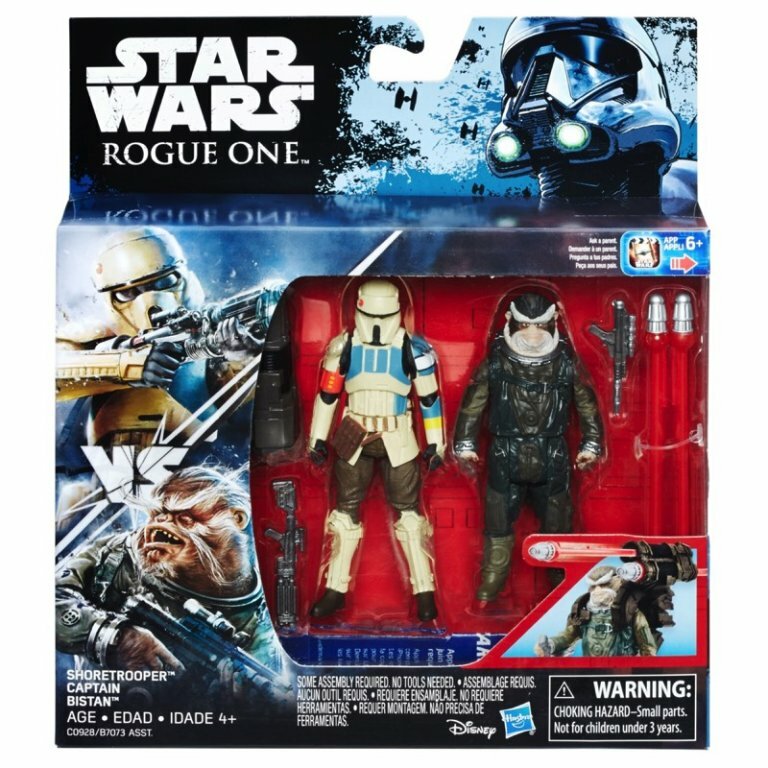 "You can add the Scarif Stormtrooper to your collection right now with the Star Wars Universe 3.75” 2-pack featuring the Scarif Stormtrooper and Moroff. All three styles of Scarif Stormtrooper will be comprar levitra online available in the 3.75” inch series in the spring. The Scarif Stormtrooper Squad Leader is available right now in our 6-inch Black Series. You can also pick up a 12” Shoretrooper next Spring." It's here too! 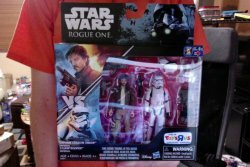 For $14.99 - and apparently not qualifying for the 20% off sale right now - the Star Wars Rogue One Cassian Andor and Stormtrooper Exclusive Figure Two-Pack is in stores now. As always, I found it in Phoenix, AZ and it was the last one at the store I visited. Good hunting! The set includes Cassian Andor from the U-Wing fighter (with slightly better paint), a redeco of the single-carded Stormtrooper, Sabine's zipline, and more. That's a decent amount of plastic for $15. Hasbro's PR firm sent us a note this morning to inform us that there's an Official Star Wars 2016 Collector Checklist! Click here to grab it. Since this is produced on the official timetable, you won't see some known-but-not-listed items like Wave 2 3 3/4-inch action figures, 2-packs, 6-inch figures, and so on. But what is on here may amaze you - a bunch of exclusives we've not yet seen! Read on to find out what you'll find in stores as the year goes on. 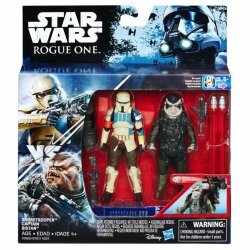 Ad: Pre-Order Star Wars Rogue One 3 3/4-Inch Action Figures Wave 2 Case from Entertainment Earth! This one's awesome - Darth Vader has a waist joint, and a belt buckle-inspired missile launcher. Last week Hasbro dropped the first wave of Rogue One: A Star Wars Story action figures. At New York Comic Con, Hasbro revelaed some more 3 3/4-inch action figures from waves 2 and 3! Baze Malbus and a Stormtrooper Officer make up a new 2-pack. 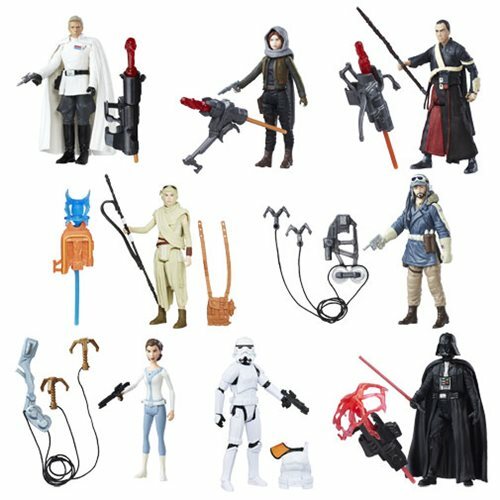 New single figures from wave 2 include Darth Vader and Chirrut Imwe. 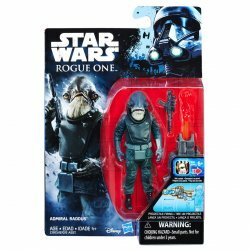 Future figures include Jyn Erso in an Imperial Ground Crew disguise, Bodhi Rook, and Admiral Raddus. We assume there is a rule all Mon Calamari must be Admirals. Hasbro sent along new The Black Series reveals from New York Comic Con! Rogue One: A Star Wars Story releases await you including a new Darth Vader, Director Krennic, a Scarif Stormtrooper, Baze Malbus, and Chirrut Imwe. Neat stuff! Hasbro's photographers sure love negative space.